Yes yes I know The Cambridges are on their Asia tour and there's many a great fashion moment happening right now. I just couldn't help posting about this oldie but goodie. I think this a dress we have seen Kate wear only once. That was in February 2011 on one of her first royal engagements with Prince Charles. I believe the event was for the Prince's Foundation for Children and the Arts. 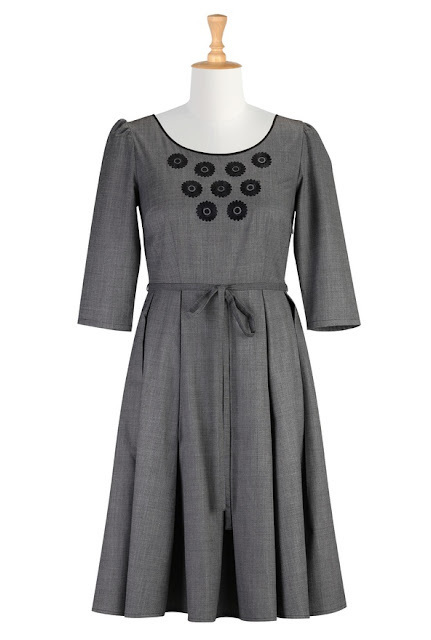 The dress is from the Orla Kiely Autumn Winter 2011 collection. It has a slight scoop neckline with floral applique detail (you can see the close-up below), 3/4 length sleeves, pleated full skirt, and waist bow detail. I like the dress and style, its very cute and I really like it on Kate. I think it they light grey shade managed to be surprisingly fresh but appropriate to the season, not too dark or heavy. I always note when Kate looks a bit long in the shoulder line but this dress is a great example of proportions that really work on her. I really love her in this fuller silhouette since the pleated skirt adds necessary fullness where she needs it most. Also good to note is the neckline doesn't make her shoulder line disproportionately long, like some of her other dresses have. My only complaint is that the waistline is a tad high on her - since she does have a long torso - making the dress look just a bit "short" on her with the hemline getting cut just a tad short as well. Surprisingly I managed to find a repliKate for this unique dress via eShakti, the winter daisy chain dress. I'll admit right off the bat, it kind of looks like a very shallow imitation. I think if they were going to take the trouble of copying the dress, they could take a bit more care with the details. But it does imitate exactly what it is supposed to be. It has the same rounded neckline with floral detail, 3/4 length sleeves, pleated skirt, and waist bow detail. This dress retails for $99.95. eShakti - winter daisy chain dress.